Supporters celebrate the result of the May 25 referendum in which voters backed the repeal of Ireland's abortion law. The country's health minister predicts the services will be free when they're offered in 2019. 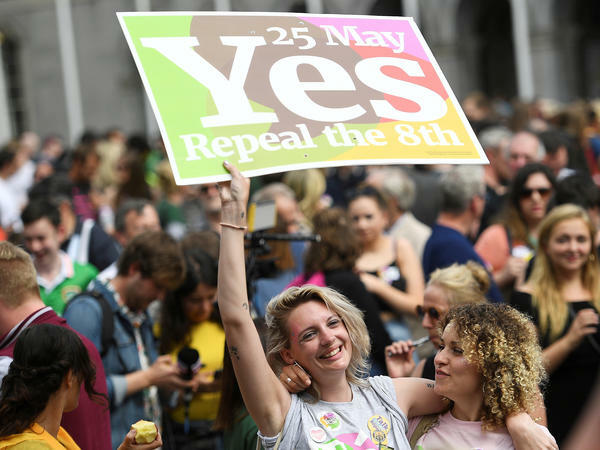 It was "an extraordinarily historic day," Harris said of the repeal, which follows up on a public referendum in May, when an overwhelming majority of voters said more women in Ireland should have access to clinics that perform abortions. "Yes, it is my intention that the services will be free," Harris said in response to a reporter's question about how Ireland will handle medical expenses for abortions. "I've said from the start that I don't want cost to be a barrier, because if cost is a barrier, you get into a situation where one of two things could happen: you see private clinics develop – we don't want that to happen in Ireland, we want this to be part of an integrated public health service — and secondly, you can see people having to continue to travel." Under the restrictive Eighth Amendment, thousands of women have traveled from Ireland to the U.K. to have abortions performed. From 2001 to 2015, the number fell by nearly 50 percent, says Ireland's office of the Health Service Executive, but Harris said in 2016 that the figure still stood at 3,265 women — and that still more had likely traveled to other European countries to seek the procedure. The next phase of Ireland's changing policies will see Harris submit a new law governing abortion. That's expected to reach the legislature in October; it could be in force by the new year. "The proposal is to allow elective abortion up to 12 weeks of pregnancy, and limited access to the 23rd week," NPR's Debbie Elliott reported earlier this year, citing draft legislation. While Ireland has done away with its near-total ban on abortion unless a mother's life or long-term health is at risk, the restriction remains in effect in Northern Ireland. As NPR's Colin Dwyer has reported, the law in most of the U.K. "allows abortion before 24 weeks of pregnancy and in some other cases."